Putting up a new 'Desi' recipe which is not my own, but my mother's. In fact almost all the 'Desi' recipes that I put up are based on hers, because not only does she make really good food but she also keeps on trying new things & experimenting with ingredients till she gets it right. So the few times that I do make anything Desi, I follow her recipes because I need to have the exact same taste :). She also gives very detailed recipes instead of the 'a little bit of this' and a 'little bit of that' that most people do, accompanied with at least a few tips and tricks :), which makes following the recipe pretty simple. Chicken Kofta's are a family favourite, and is made regularly at our home, for both family meals as well as parties. Since we rarely eat beef/mutton at home, almost everything from kofta's to shami kebab's to nihari is made out of chicken at home. Not only are these kofta's healthier, but they taste amazing but they are so soft & delicate that they literally melt in the mouth. Mix all the above ingredients in the chopper and grind till fine. Keep the ground meat in the refrigerator for about 30 minutes before making small balls. If required, the ground meat can be kept in the refrigerator for at least a day prior to cooking. 1. Heat oil in big pot. Fry onions till golden then take them out leaving the oil in the pot. Blend onions with yogurt in blender. 2. Add ginger garlic paste, dhaniya/coriander powder, red chilli powder & salt. Saute for 2-3 minutes. Add the blended onion & yoghurt mixture. Start the bhunna/saute process (detailed explanation provided in note below), by stirring the masala constantly with a wooden process while adding a little water as needed. The 'Bhunna' process is complete when you can see the oil on top of the masala. The masala should be dryish, with the water being added in small increments to prevent it from sticking to the bottom of the pan. 3. Add 3-4 cups of water to the masala & let it come to a boil. 4. Once the salan/curry is at a boil, add the kofta/meatballs and cook for 5 minutes. Be careful while adding the kofta's so that they don't break, and instead of using a spoon move the pot around using kitchen napkins/gloves to incorporate the kofta's in the salan/curry. 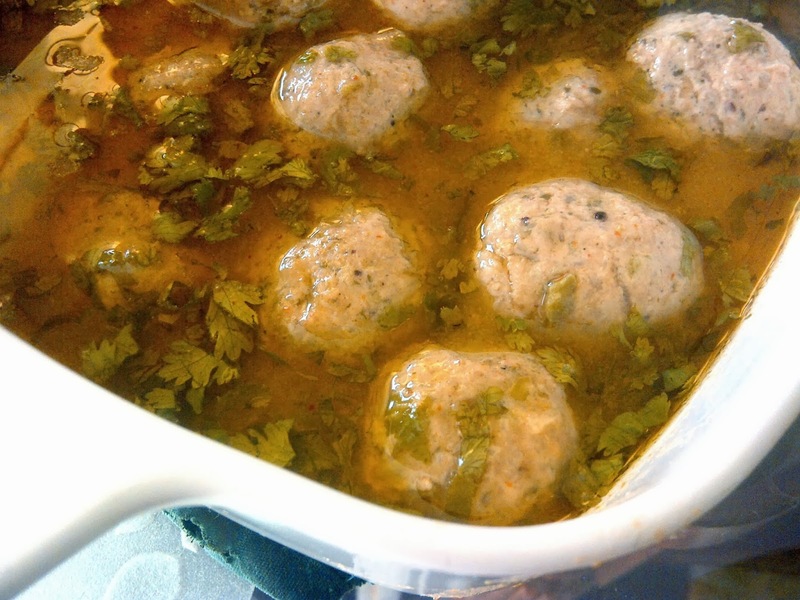 The reason being that since the kofta's are made from chicken, they are quite soft and prone to breaking, hence the best method is to swirl the pot around with a spoon only being used if required. 5. Cook on high flame for 10-12 minutes, then let it simmer for 30-40 minutes till cooked. 6. Garnish with green corriander/dhaniya right before serving. 7. Serve with a simple salad of sliced onions, salt, vinegar and fresh dhaniya/corriander along with fresh roti and/or steamed process. 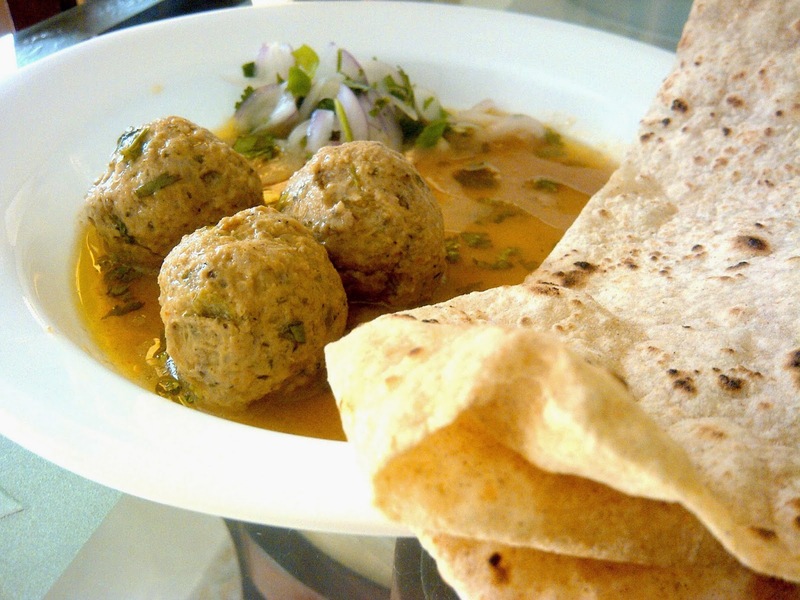 'Bhunna' is a term that we use for almost every gravy that is cooked in Pakistan. It is a style of sauteing, however, the technique differs from the western style. It is the process of cooking the selected ingredients over medium to high heat, stirring constantly & adding small quantities of liquid as required to prevent sticking. Generally 'Bhunna' is required at only one stage in the dish, for ingredients like onions, ginger, garlic, tomatoes and spices to remove the raw flavor. Once the oil comes to the top of the masala the process is completed with the protein added after the 'Bhunna'. In some cases like with 'Bhuna Goosht' or with 'Mincemeat', the 'bhunna' process is repeated a second time after adding the meat.